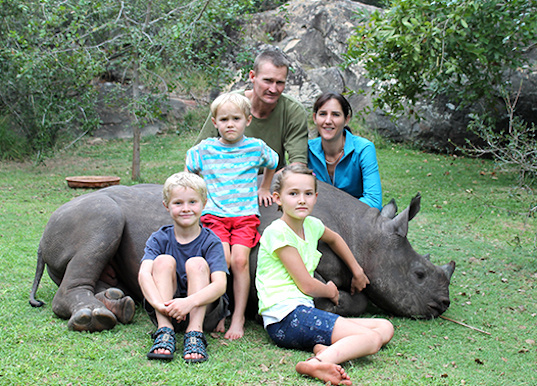 “Chizi’s Tale: The True Story of an Orphaned Black Rhino” is an eye-opening, real-life children’s story of an orphaned baby rhino who was lucky enough to be taken in by a Zimbabwean conservationist and his family. Chizi was lovingly raised and prepared for release back into the wild by his carers, but in their three years together he proved to be quite a character. Written by a Connecticut high schooler who has spent numerous summers in Africa, the illustrated story is age appropriate and reveals the surprisingly gentle nature of these imposing creatures. With charming illustrations by Zimbabwean artist Jacqui Taylor, the book is an excellent introduction to conservation issues for young readers. As an added bonus, all proceeds from the book go to the conservation charity Tusk. Read on for the full review. "Chizi's Tale: The True Story of an Orphaned Black Rhino" is an eye-opening, real-life children's story of an orphaned baby rhino who was lucky enough to be taken in by a Zimbabwean conservationist and his family. Chizi was lovingly raised and prepared for release back into the wild by his carers, but in their three years together he proved to be quite a character. Written by a Connecticut high schooler who has spent numerous summers in Africa, the illustrated story is age appropriate and reveals the surprisingly gentle nature of these imposing creatures. With charming illustrations by Zimbabwean artist Jacqui Taylor, the book is an excellent introduction to conservation issues for young readers. As an added bonus, all proceeds from the book go to the conservation charity Tusk. Read on for the full review.